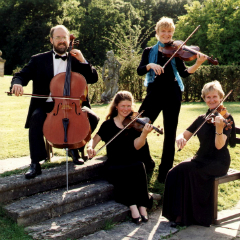 Our wide selection of styles will take you from Pachelbel's Canon, Bach's Air on the G string and Handel's Water Music through Haydn's Serenade and Mozart's Eine Kleine Nachtmusick to Elgar, Borodin, Tchaikovsky and on to the Waltzes and Polkas of Johann Strauss, the Ragtime of Scott Joplin and witty arrangements from the songs of George Gershwin and Cole Porter. Or perhaps you would like to hear a favourite Beatles tune, a TV theme or a song from the shows? Whatever your taste, our music will create the perfect mood for your event!